(CNN) -- A 25-foot dead whale washed ashore on New York's Jones Beach Island on Thursday morning, a New York State Parks official said. George Gorman, director of recreational services for New York State Parks, told CNN that officials believe it's a humpback whale. Jones Beach Island is a barrier island bordering the south of Long Island and a popular recreational spot for New Yorkers. 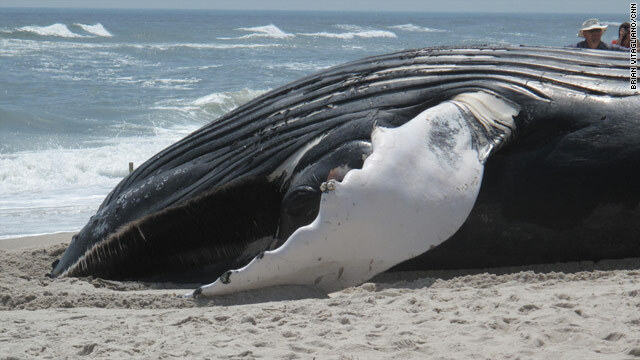 The New York State Marine Mammal and Sea Turtle Stranding Program -- a branch of the Riverhead Foundation for Marine Research and Preservation that rescues and rehabilitates marine animals -- was called to examine the whale and remove it from the beach. Riverhead officials estimate that the animal weighs 20 to 25 tons. The group is moving the animal out of the path of the incoming tide with a tractor. An necropsy will be performed Friday and then officials will determine where to bury the remains.